An award winning motorsports journalist, Deb Williams has covered auto racing for more than 30 years. She began her career covering weekly short-track races in Asheville, N.C., while a student at East Tennessee State University and continued after becoming the sports editor at the newspaper in Waynesville, N.C. Upon joining United Press International in Raleigh, N.C., as a general assignment reporter, she began covering NASCAR's top two series and continued to do so after being named UPI's Charlotte, N.C., bureau manager. After leaving UPI, she spent 18 years with the publication NASCAR Winston Cup Scene, serving as its editor for 10 years. 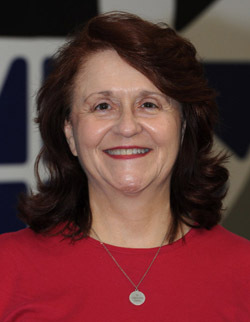 Her numerous honors include the Henry T. McLemore Award, the Russ Catlin Award and the George Cunningham National Motorsports Press Association Writer of the Year award. She has received NMPA awards for columns, news, features and magazine stories. She has written three books. Her most recent, “The Evolution of NASCAR, A Historical Collection, was released in November 2010. Williams has taught the Evolution of Southern Motorsports at Appalachian State University, and has been interviewed for historical motorsports shows that have aired on ESPN and SPEED. She resides in Concord, N.C.
MARTINSVILLE, Va. – Joey Logano claimed his third straight pole at Martinsville Speedway Friday and readily admitted that last year’s incident with Matt Kenseth at the half-mile track had become a major motivator for him. MARTINSVILLE, Va. – Ryan Blaney is no stranger to Martinsville Speedway, having produced four top-10 finishes in five NASCAR Camping World Truck Series races at the half-mile track; a fact the 22-year-old believes will benefit him in his Sprint Cup debut Sunday in the STP 500. One year after Kyle Busch lay in a hospital bed in Daytona Beach, Fla., wondering if he would ever drive again due to severe foot and leg injuries he suffered in the 2015 Xfinity Series season opener, the NASCAR Sprint Cup champion produced his best-ever finish in the Daytona 500. Two years before Chase Elliott was even eligible for a driver’s license, NASCAR Hall of Famer Bill Elliott met with multi-car team owner Rick Hendrick about his son’s future. Five days before NASCAR kicks off its 2016 season with the Sprint Unlimited at Daytona, the sanctioning body’s first-ever charter system is in place. CHARLOTTE, N.C. – Stock car racing’s early years weren’t financially lucrative when compared to today, but for NASCAR Hall of Famer Bobby Isaac, the sport provided a means to escape poverty and become a champion. CHARLOTTE, N.C. – A 6-foot-2, ruggedly handsome Virginian, Curtis Turner combined his brazen driving tactics with a swashbuckling lifestyle to carve himself a unique place in NASCAR history. CHARLOTTE, N.C. – Leavine Family Racing and Circle Sport Racing, owned by Joe Falk, have entered into a partnership that will allow LFR to run full time in NASCAR’s Sprint Cup Series with drivers Michael McDowell and Ty Dillon. CONCORD, N.C. – When Monster Energy MXGP of the Americas rolls into zMAX Dragway Labor Day weekend it will mark the culmination of nearly two years of work by Speedway Motorsports Inc. executives to bring professional motocross to the Charlotte area. CHARLOTTE, N.C. — Seven-time NASCAR champion and veteran team owner Richard Petty said Wednesday that he believed NASCAR and the sport’s team owners had reached an agreement on about 75 percent of the sanctioning body’s charter program which would provide teams with long-term equity.